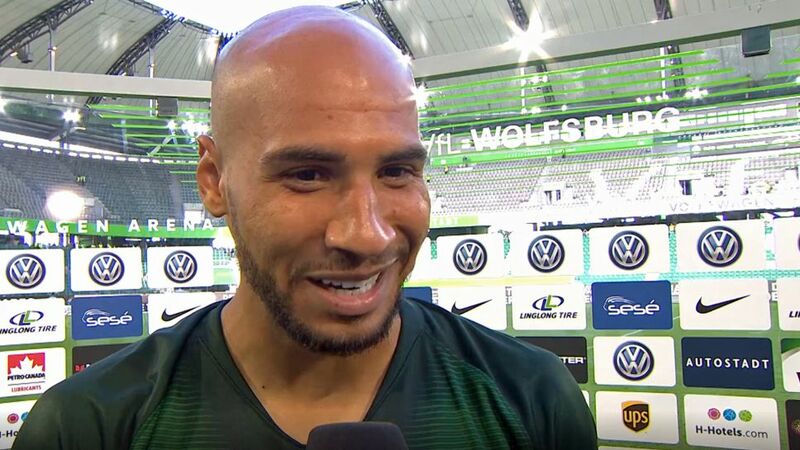 John Brooks has declared himself fighting fit after celebrating his 100th Bundesliga appearance with the opening goal in Wolfsburg's 2-1 win over ten-man Schalke. Ankle and knee injuries restricted Brooks, 25, to just nine Bundesliga games in his debut season as a Wolfsburg player, but the USA international was back to his best on Matchday 1 of the 2018/19 campaign. "First of all, I'm glad that I'm on the pitch and that I'm healthy - that's the main thing," former Hertha Berlin defender Brooks told bundesliga.com after the match. "That I scored the goal to help the team, of course it's nice. I'm happy." Brooks has every reason to be. In his six competitive outings since returning from injury in April, Wolfsburg have posted five wins, trouncing Cologne in a must-win meeting on the final day of 2017/18, overpowering Holstein Kiel over two legs in the the relegation play-offs, battling past fourth-tier Elversberg in the DFB Cup first round and outmuscling the 2017/18 Bundesliga runners-up on Matchday 1 of the new campaign. As well as opening the scoring with an unstoppable first-half header against Schalke, Brooks was rock-solid defensively, winning 62.5 per cent of his attempted challenges. He also hit the mark with 90.7 per cent of his attempted passes from open play. The concession of a penalty, from which Nabil Bentaleb temporarily brought the visitors level before Wolfsburg substitute Daniel Ginczek won the match in injury-time, was the only blot to his copybook. Click here for more Wolfsburg news, views and features!